Catch it on the big screen! Hosanna filio David - silenced? Popule meus: chant or polyphony? Is sacred music too much to ask? Some new titles for sale; Aquinas, Bouyer, etc. As Passiontide approaches, some sacristans will be retrieving those violet drapes and ironing them in preparation for the traditional Roman custom of veiling sacred images etc in the fortnight before the Sacred Triduum. 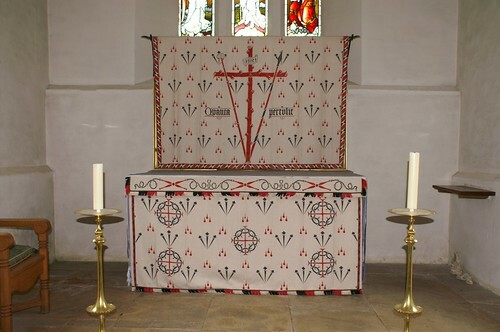 However, in the Sarum use, the sacred images and the Altar were already veiled on Ash Wednesday and rather than violet cloth (which would have been an expensive dye to acquire), bleached linen with simple Lenten and Passion designs are used: the idea was for a general negation of colour during Lent. "In [the Sarum] tradition "according to the rules that in all the churches of England be observed, all images [are] to be hid from Ash Wednesday to Easter Day in the morning." This is called the Lenten Array and it includes a curtain which hides the reredos, a frontal which covers the altar, and veils which cover other statues and pictures in the church. The color was Lenten white which was natural linen material, sometimes referred to as ash color. According to An Introduction to English Liturgical Colours, "The explanation of this use of white, which is closely akin to ashen, is 'in this time of Lent, which is a time of mourning, all things that make to the adornment of the church are either laid aside or else covered, to put us in remembrance that we ought now to lament and mourn for our souls dead in sin, and continually to watch, fast, pray, give alms....,' wherefore 'the clothes that are hanged up this time of Lent in the church have painted on them nothing else but the pains, torments, passion, blood­shedding, and death of Christ, that now we should only have our minds fixed on the passion of Christ, by whom only we were redeemed." This practice made a startling transformation of the church for the whole of the Lenten season so that Easter literally burst forth like the Lord from the tomb when the church was returned to normal state." Having looked at a few Lenten Arrays, I have become rather partial to them. In a weeks' time I shall visit the lovely Catholic church of St Birinus in Dorchester-on-Thames. Some NLM readers may recall my post on this liturgical gem in Oxfordshire; I shall be making a trip there with Fr Aidan Nichols, OP to see its Lenten Array, so stay tuned! In the meantime, for more examples of Lenten Arrays, do look here and here.